Last week was full of work, so I had to cram all my fun into the weekend. Luckily, there is more than enough to do in Portland. 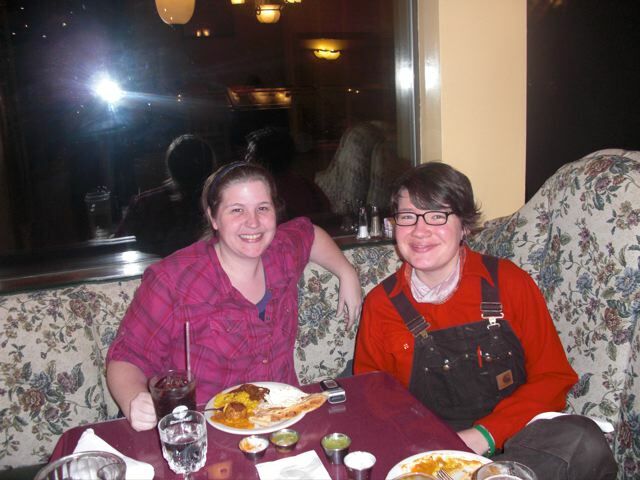 On Friday my friend Jennifer and I hit up Namaste for dinner, which is an Indian buffet. Usually Indian restaurants only have the buffet at lunch, so I was super psyched to find a place that did the buffet for dinner. I always want a bunch of different stuff, which can be quite spendy, so a buffet is a perfect for me. The best part of Namaste is that it used to be some sort of family dinning place, so all the decor is all American Logging Nostalgia. I'll take just about any kind of decor if it means I can have unlimited naan. Looking at the pictures now, I'm ready to go back. The food on the plate looks so good, but it could just be that I haven't had dinner yet. Check out the awesome booth fabric. On Saturday my friend Cherri had an open house for her studio, and you could tell that we were a bunch of quilting bloggers because everybody had their cameras. 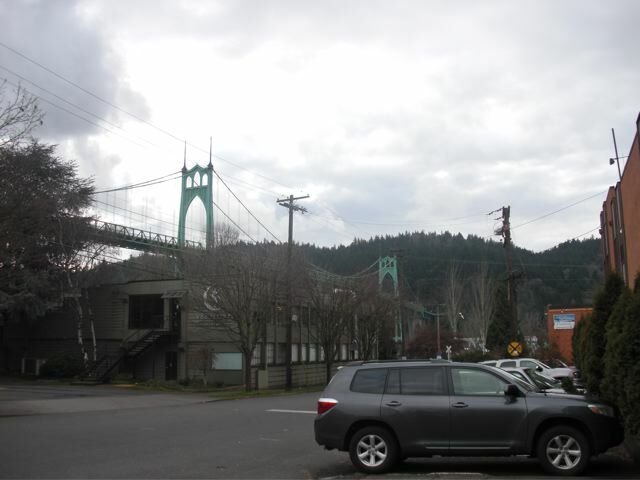 Cherri's studio itself is lovely, and it's right next to the St. John's bridge. She had a bunch of cookies and milk, which was a very nice touch. She even had little packets of color pencils for everyone. She's a lady how knows how to throw a party! What a very Portland type view! 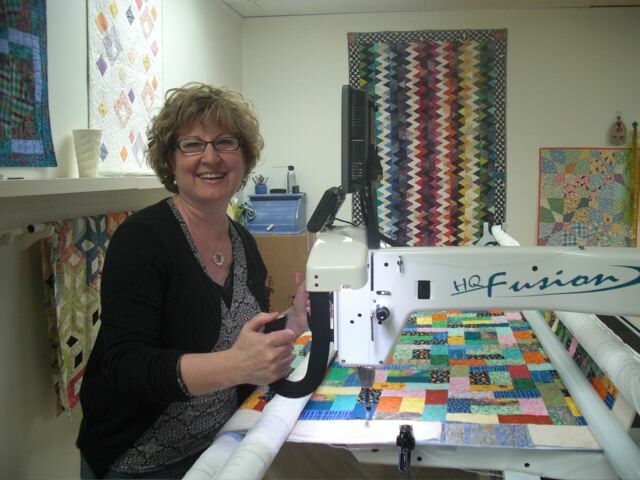 Cherri just bought a long arm machine, and had a charity quilt top for everybody to try their hand at quilting. I love the diamond quilt that is behind Jenn. 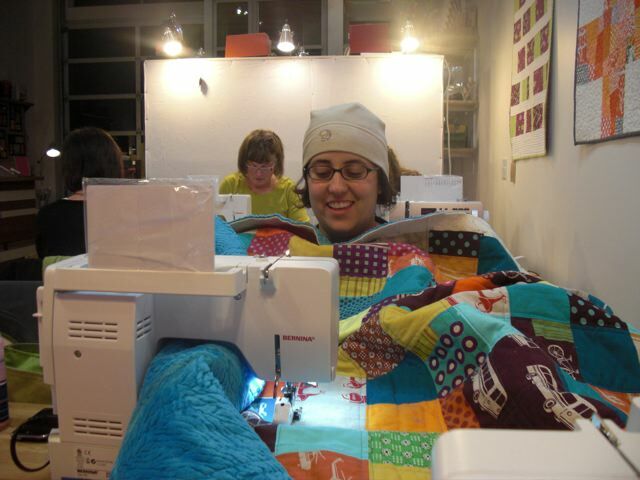 One of the things I like best about the Portland Modern Quilt Guild is that is such a fun social experience. 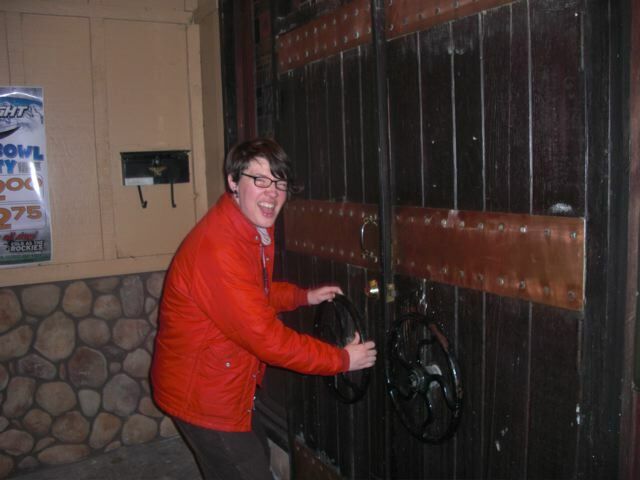 I got to talk to a lot of people from the guild at this party, and it's fun to get to know everyone better. Joan told me that she was considering trying to quilt 15 minutes a day in February. Do it Joan! Do it! And of course, on Sunday it was me and Fritz. 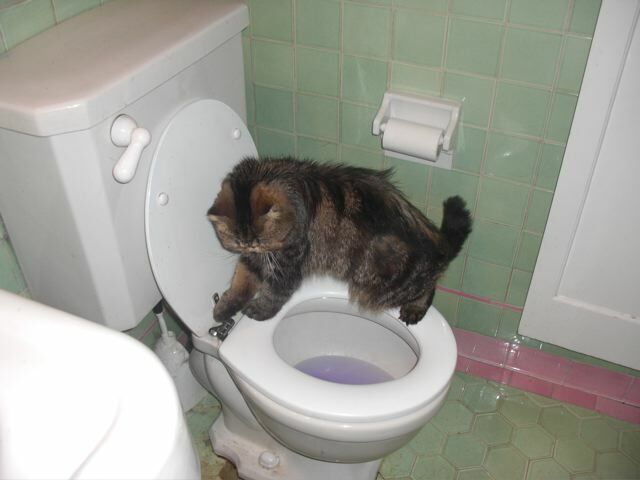 When I went to Winco I bought one of those toilet cleaner tabs, solely for the reason that it turns your toilet water purple. I think it matches the horrible green and pink tile nicely. After I got it I wondered why there weren't a range of colors available to match any bathroom decor, but maybe most people don't really want their toilet water to match their bathroom. Fritz is very interested in the purple water. That, or annoying me constantly. 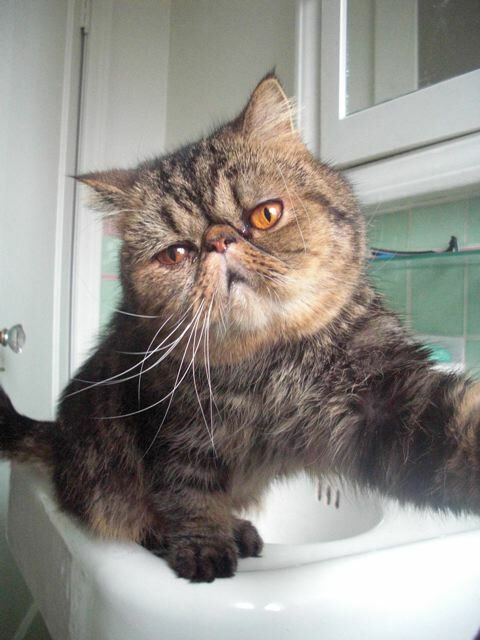 Fritz hasn't stopped living in the bathroom. He only leaves to eat or use the litter box, and every time I go in there he demands a lot of attention. Don't ask questions about this picture you don't want answers to. He makes a pretty pathetic face, but I love him anyway. Today was back to work, but at least I'll have the thoughts of another fun weekend to keep me going. 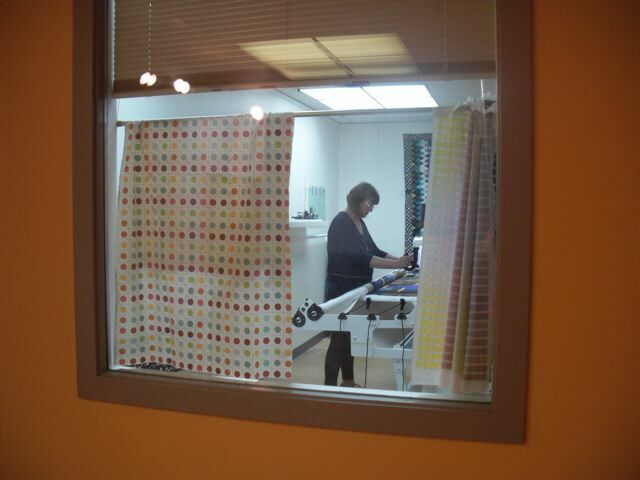 My friend Cherri just got herself an amazing new sewing studio, and a new long arm machine. She graciously invited me to stop by and see the studio and try out the machine. 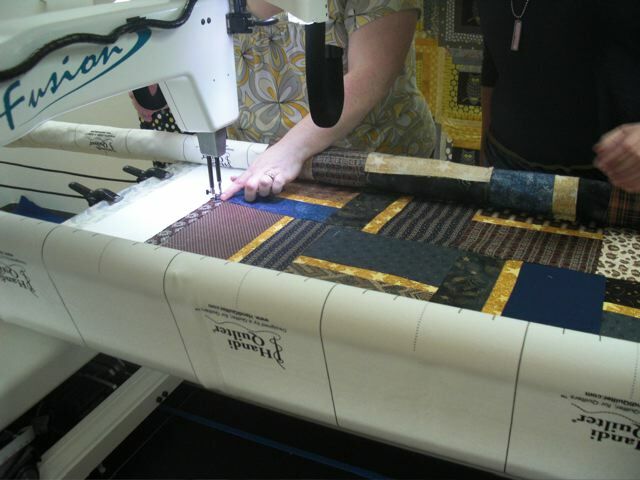 My other friend Rachel patiently taught us how to use the machine, and more importantly taught us how to approach the design of the quilting, block by block. 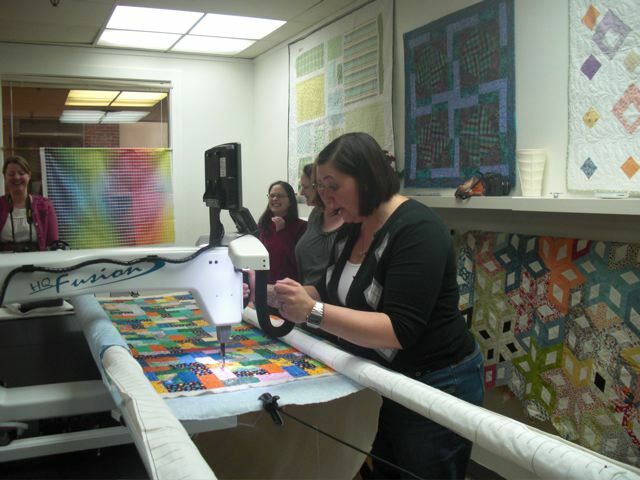 Jill and Kaci were also there, so the five us us worked on collaboratively quilting one of Rachel's charity quilts. The long arms was a lot easier to use than I thought it would be, and I'm looking forward to taking advantage of Cherri's good nature and quilting one of my quilts on her machine! Rachel told me not to take a picture of her, but I think this will work if I don't have her head in there. I also took advantage of Cherri's open floor space to finally baste the quilt I've been working on for my dad's girlfriend. I'm so glad to finally get it basted. I've been putting it off because I hate basting, and as a consequence I haven't been doing any quilting at all lately. I can't start another project until I get this done! 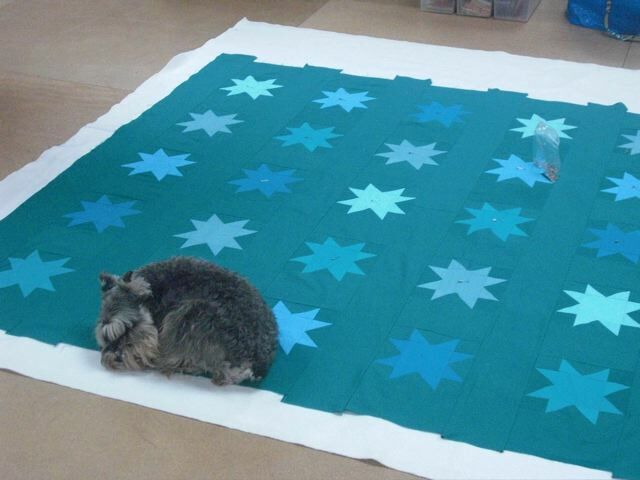 Cherri's adorable dog Lulu did what all animals do when confronted with a quilt, which is to sleep on it. After I left Cherri's studio I met up with my friends Leslie and Chris and we went to Chang's Mongolian Grill. Leslie and I have a pretty sentimental attachment to Chang's, because we used to go their every Saturday after camp was over when we were camp counselors together. We would look forward to it all week. 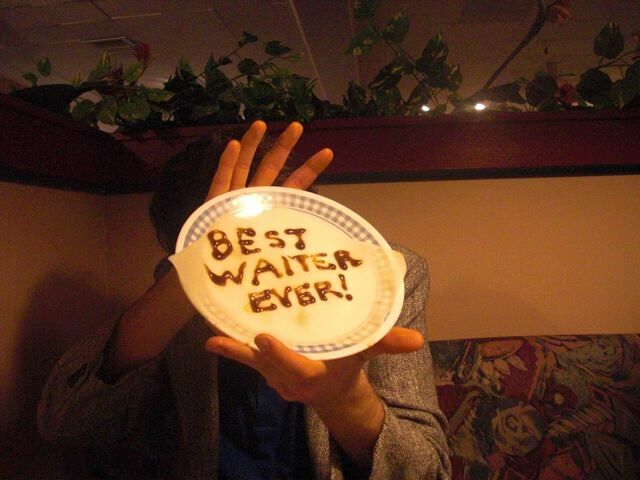 This particular time, our waiter was by far the most awesome waiter we'd ever had. We wrote him a note to let him know this, and then waited until he went in the back for something and hightailed it out of there before he could see that we wrote it. We had a lot of debate as to if we should show it to him while we were there, but ultimately chickened out. 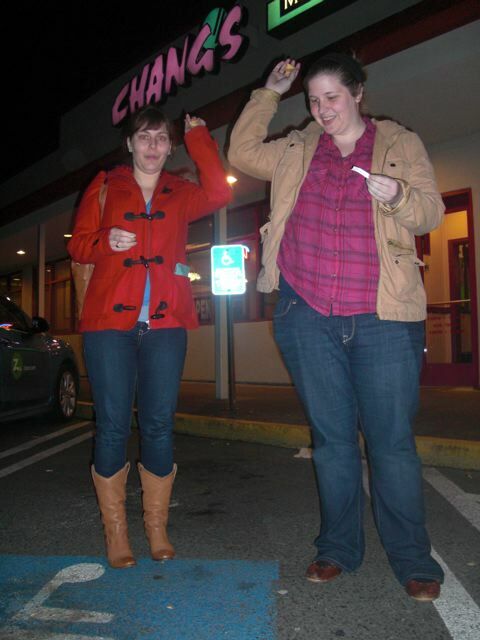 At Chang's, we have a tradition of getting fortune cookies, reading the fortunes, and then throwing the cookies on the ground in the handicap parking spot. Don't ask me how it got started, but we do it every time we go. My fortune said "You may have to modify your plans". Chang's is in the same parking lot as Winco, so we went there too. 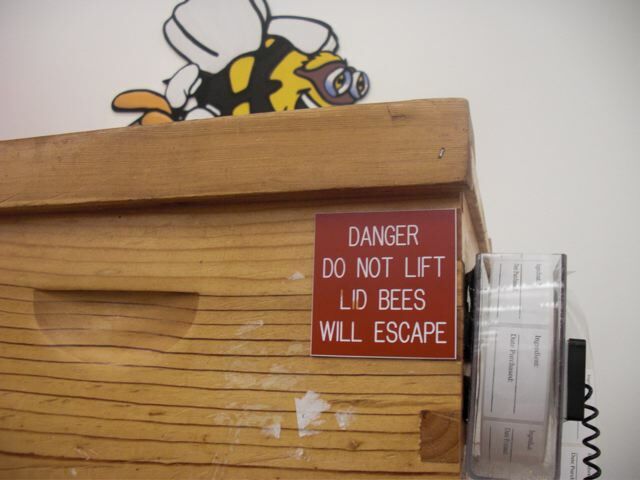 I used to shop a lot at the Winco in Salem when I worked at camp, and I always loved and feared the honey section. 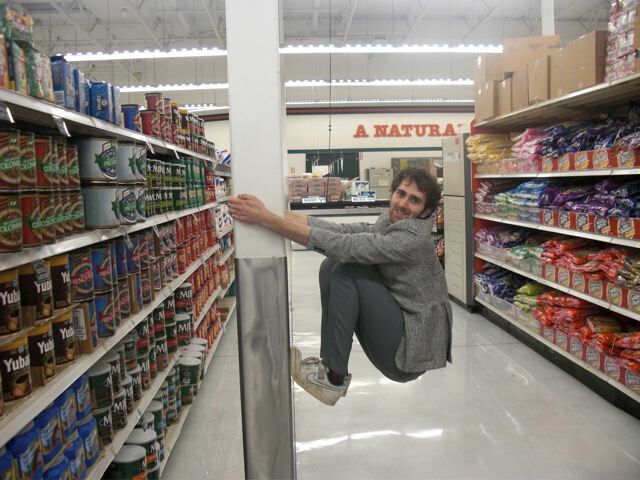 We had a pretty fun time just wandering the aisles and finding weird things. Chris managed to find some climbing time. 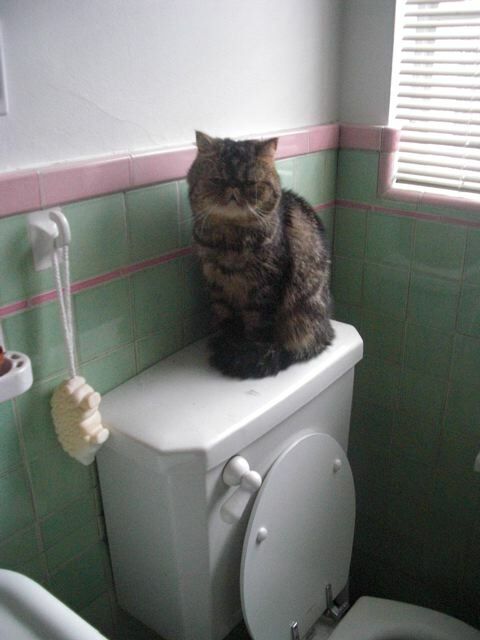 In Fritz related news, he's taken to spending all his time on top of the toilet. It's not so bad, but he's started to put his paw on my shoulder every time I sit down in an effort to get me to pet him (with mixed results). He's a strange cat sometimes. At least he's not on the toilet seat anymore. I spent most of today in Salem getting some training for the class I'm teaching. It wasn't so bad, and I sat next to a woman who was going to be teaching Wine Marketing at the Chemeketa Viticulture center. My dad teaches almost all of the Viticulture (grape growing) classes, and it turns out that she and her partner David Adelsheim had bought grapes from my parents for many years. Small world huh? The grape world seems even smaller. Last night though, I got together with some of the ladies from PMQG for some much needed food and sewing. As always, I had a fantastic time. We hadn't gotten together for awhile due to the holidays, so it was nice to see everyone. Jill was kind enough to let me take a photo of her and her awesome quilt. I spent my time at Modern Domestic putting together the green stripe in the quilt top below. 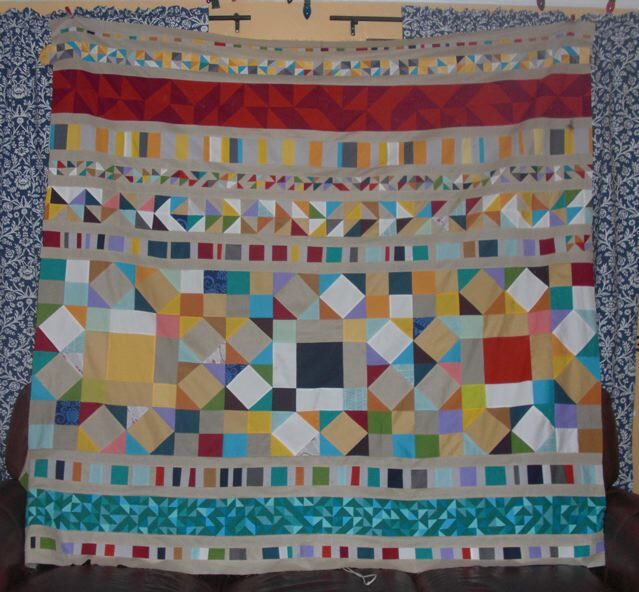 All the rows are made up of scraps leftover from other quilts, except the big one which is made up from leftover yardage. 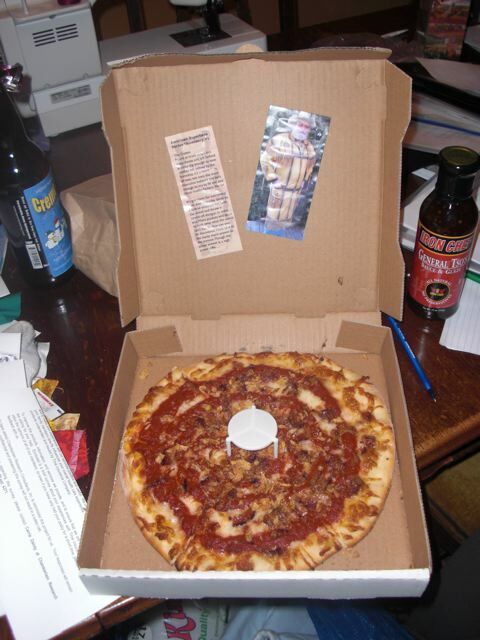 Here is where the indecision comes in. For some reason, I thought that all of these pieces together would give me a much longer quilt. It's not a bad size. It's roughly 5 feet by 6 feet, but a really good couch quilt should be bigger. At least for me anyway. So, I could wait until I have a few more scrap rows and add them on (which would be after a few more quilts), but I'm sort of liking it the way it is. Considering the amount of time it took me to put all of this together, I'm not sure I would use this as a couch quilt anyway. I eat a few meals on my couch and it seems inevitable that I would get spaghetti sauce on it. It may be destined for the safety of my closet. I can't decide if I want to wait and add more, or just quilt it now. I think I'll sleep on it. As for Fritz, he's been driving me nuts lately. He's been knocking stuff over. I'm going to go ahead and blame most of the messiness in this picture on him. And it's no surprise that he's hanging out where he shouldn't be. 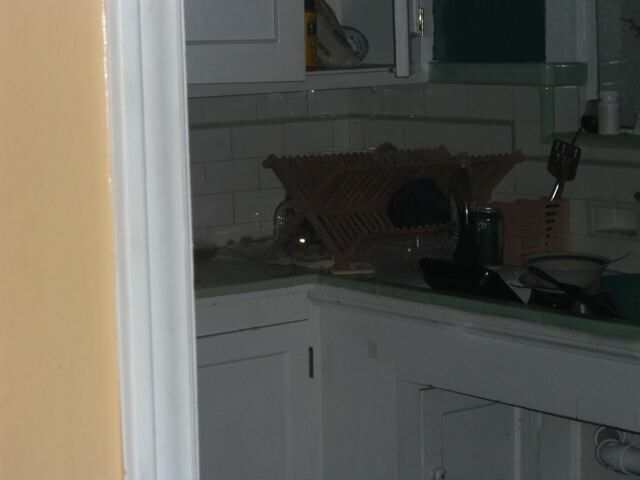 Would you believe that Fritz left all those dirty dishes in the sink? 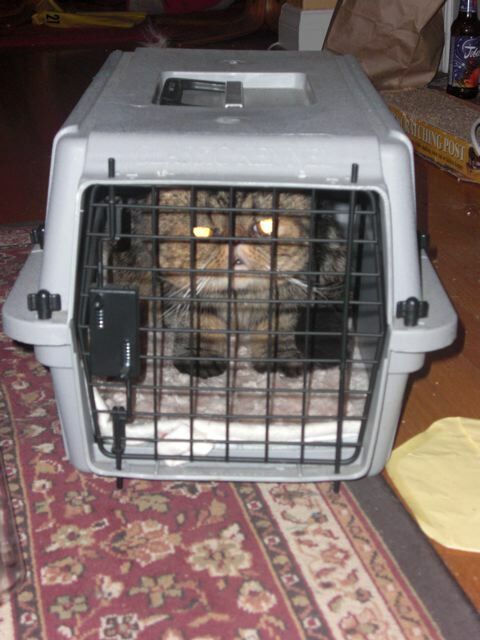 So tonight when he started jumping up on my sewing space, I decided he could use a little time in cat prison. Hopefully it will scare him straight. Sometimes in life, you are Gallant, always putting other people's needs before your own, acting with kindness and empathy, and serving as an example for all those around you. 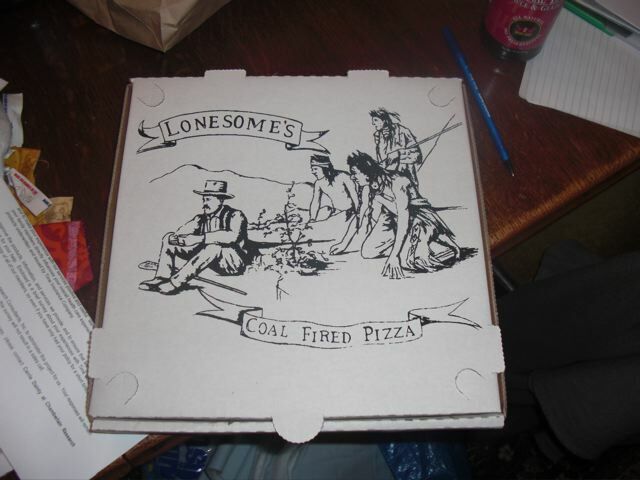 Sometimes though, you are Goofus, and act lazy, are selfish, and take what you want and damn the consequences. Today I am Goofus. Wheeeeeeeeeeeeeeeeeeee! 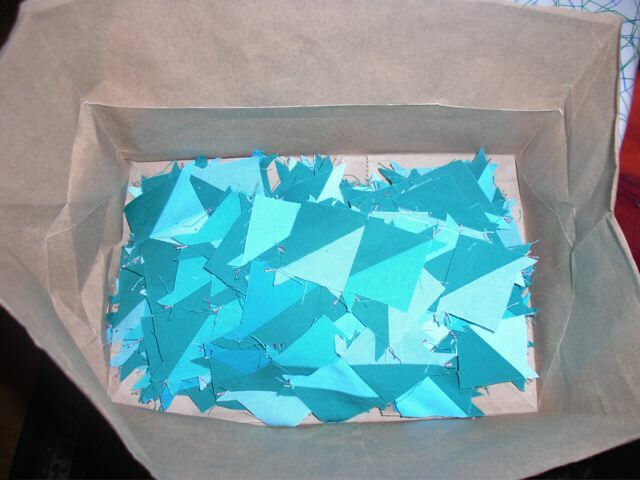 These are half-square triangles made from the leftovers of the flying geese for the star quilt I made (and have not finished even thought it was meant to be a Christmas present) for my dad's girlfriend. If I were in a more Gallant like mood I would have basted that top so I could finish it. Maybe tomorrow I'll be Gallant instead of Goofus. 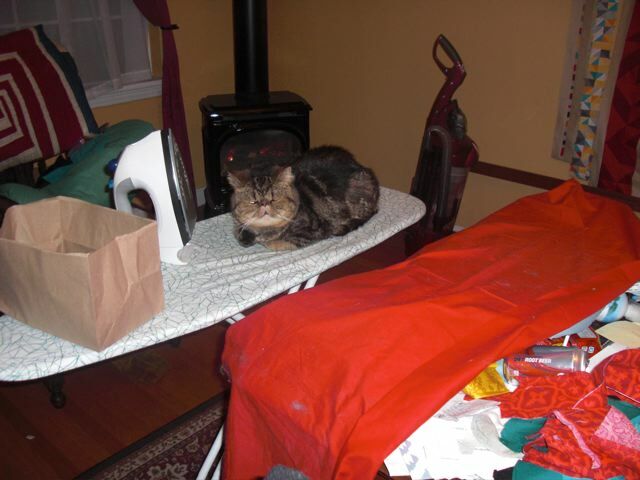 In Fritz news, he has taken to sleeping on my ironing board. I put the red sheet on it to protect the board from excess hair, and he looked so happy there, I started using my big ironing board when I was working on the half-square triangles instead of tossing him on the ground and using the table top ironing board. It's normal for one person to have two ironing boards, right? 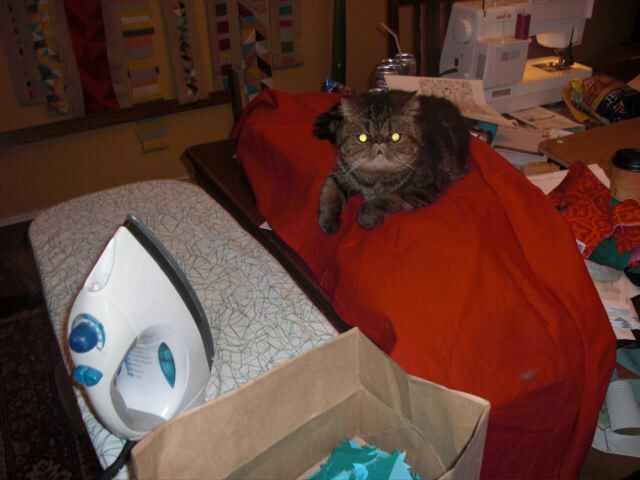 Fritz was very interested in my ironing, and watched attentively the whole time. 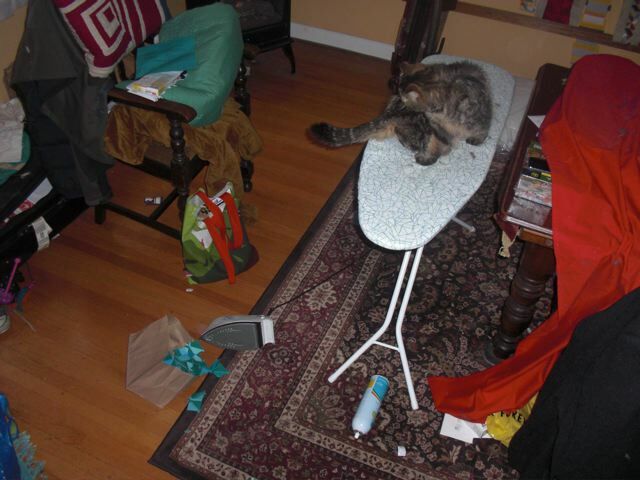 After I was done, I went to watch some TV, only to look over and see that Fritz had found a new ironing board. Also, I had my first class today! I think it went pretty well. The students all seemed to be active listeners, and nobody looked like they were checking their Facebook page while I was talking, so I'll count that as a success. I'm just now realizing that even though I have most of the materials from the previous instructor, I will still have to develop a lot of my own materials. I was sitting at the computer last night working on my syllabus, and it felt a lot like being back in school and doing homework. But at least I get paid this time, instead of paying to take the class!